Got the DL 11' hammock all sewn up. Just waiting on the suspension to arrive. 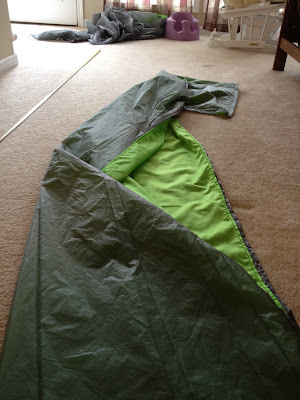 1.5ish "NUCLEAR" green taffeta inside, 1.1 grey ripstop outside. I did it this way so I can use a pad if I want in colder months. Weight is not an issue as I'm 155 soaking wet. This thing would probably hold someone in the 275 lb range. Post more pictures as you get it finished! Yea, the suspension should be here tomorrow. Amsteel 7/64 for the whoopie slings and Zing-it for the ridgeline. I've also gotta make the bugnet. It never ends.... UGH! Cadyak - If you're not busy this weekend (understand it's father's day) then come on to Jack's River. I'll let ya try out one of my hammocks. You can then decide what ya like. That sounds awesome man. I love that area and I am desperate to get out and do some camping. I do however have something planned on sunday. When are you headed up? Headed up on Saturday AM. Fairly early. Email me at jmblackston@gmail.com if interested. I'll give ya more details then. Btw, anyone looking to make whoopie slings or do any splicing at all, buy a loop turner! It'll save you so much grief! Just what I needed was one more sewing machine..but that one I wouldn't mind having..